In 2012, Marine Corporal Christopher Van Etten was on his second deployment serving as an Infantryman with the 1st Battalion, 7th Marines in Sangin, Afghanistan. Near midnight on June 13, Cpl Van Etten and his unit were breaking down their observation post when a squad member was injured by an improvised explosive device (IED). While assisting with the evacuation and helping his comrade onto the helicopter, Cpl Van Etten stepped on another IED. The blast resulted in the loss of both of his legs. Christopher was able to make an impressive recovery and was released from the hospital just three weeks after his injury. Two months following his injury, he was walking on prosthetics. Medically retired in June 2013, Christopher stays active by playing wheelchair lacrosse, monoskiing and riding his motorcycle. In summer 2016, Christopher modeled for Jockey’s Show ‘Em What’s Underneath campaign. In November 2017, he debuted on the soap opera General Hospital as the reoccurring character Chet. Christopher is currently going to school for business and he and his wife Samantha became parents to a baby boy in 2018. 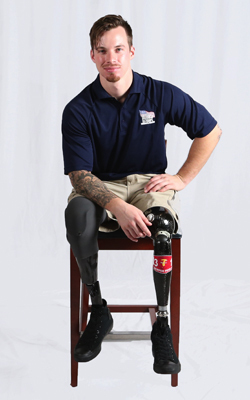 His specially adapted home from Homes For Our Troops customized to his injuries helps with parenting duties, and with daily living. When Chris is home, he frequently relies on his wheelchair, which can make navigation difficult. The new home’s open floor plan, roll-under sinks and pull-down shelves make it easier for him to cook for himself, and a roll-in shower allows him to bathe safely. Christopher is passionate about fitness and hopes to open his own gym, one where he can offer specialized exercise training to those who are injured. Living in a specially adapted custom home is one additional benefit that will allow him to fulfill this dream. Originally from Illinois, Chris chose to live in Southern California. Chris says he is grateful to Homes For Our Troops’ donors and supporters for helping give back and making a difference in the lives of injured Service Members. “The one place a person should be comfortable is in the comfort of their own home, and because of Homes For Our Troops and its supporters, that will be possible for me,” he says.